What did your research aim to do? The key aim of the research was to understand how, in a changing technological and socio-economic environment, copyright law trickles down and is played out in day-to-day creative practices. The research focussed on individual creators and their understandings of how copyright intersects with their careers, in particular how relevant or irrelevant it might be to them and whether or not it hinders or benefits their creative practice. In order to investigate the role of copyright across different creative disciplines an extensive study was initiated. Over 120 formal in-depth interviews were conducted with a range of writers, illustrators, composers, visual artists, and performers. The interviews were undertaken (and in conjunction with observations) at selected literary and arts events and festivals (for example: Edinburgh International Book Festival, Edinburgh Fringe, Ars Electronica, Transmediale, Future Everything, Go North!, FACT Liverpool and others), and informal conversations with various agents, managers, curators and arts organisations. Additionally, organisations that play an important role in representing creative practitioners, such as the Association of Illustrators, the Musicians’ Union, the Scottish Artists Union, and the Society of Authors in Scotland, were consulted. 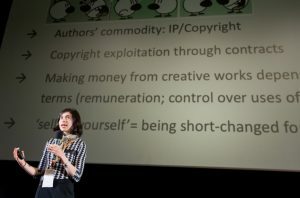 Copyright underpins the professional practices of a range of individual creators and many see it as valuable both economically (through monetary reward) and personally (when aspects such as reputation, attribution and ownership are viewed as important). In a precarious professional environment, where individual creative careers are portfolio-based, copyright continues to have a useful role. At the same time copyright is not always viewed as optimally configured when it can, in certain instances, restrict creative pursuits or fail to serve professional creators’ interests. Creators’ relationships with copyright are complex and cannot be understood in economic terms alone. The value and utility of copyright, to an individual creator, is dependent on a number of factors; such as the nature of the creative practice, associated sources of earnings, awareness and understanding of copyright as applied to one’s practice, philosophical or political disposition. For instance, one common presumption is that copyright is only valuable to those creators that exploit their creations for monetary reward. However, my findings indicate that creators’ ability to exclude others through copyright is also valuable and it is perceived to be beneficial for several reasons, even by creators who don’t often, or perhaps never, exploit copyright. What impact has your work had so far/what impact do you anticipate it will have? A cursory look at popular media demonstrates that not only is copyright protection highly controversial but it is also an issue that polarises opinion. My work will contribute to dispelling various myths and misgivings that have come to be associated with the role of copyright in the working lives of creative practitioners. Recently, I took my findings to the largest arts festival in the world in order to engage the general public on the role of copyright in the lives of creatives. 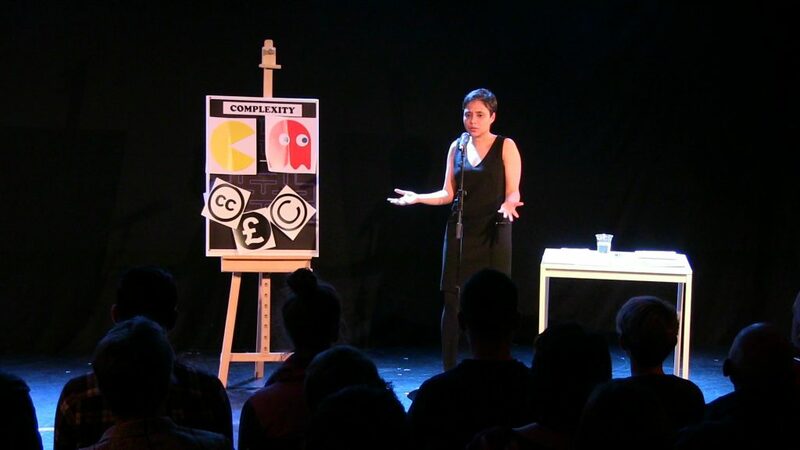 My spoken word show at 2017 Edinburgh Fringe (via Beltane Public Engagement Network’s Cabaret of Dangerous Ideas), used entertainment and story-telling to deconstruct notable copyright controversies while sharing narratives of individual creators’ lived experiences. I also took my findings to local creative practitioners in Edinburgh at the Creatives Mean Business initiative by Creative Edinburgh. My work is relevant to policy discussions on how copyright can more effectively serve the interests of individual creators. At a meeting of the European Group of The International Federation of Musicians I drew on my findings to underline how the provisions in the proposed EU Directive on Copyright in the Digital Single Market can be recalibrated to properly and more positively affect the working lives of creators. As a direct consequence of my research for this project I have collaborated with two music industry partners (British Academy of Songwriters, Composers & Authors and Music Managers Forum), and we successfully obtained an AHRC Creative Economies Studentship to evaluate whether the current legal framework is fit for purpose in rewarding musicians and music creators in the changing digital music consumption landscape. How has your association with CREATe helped to take things forward? It has provided opportunities for engaging with academics from different institutions on interdisciplinary research and for disseminating findings to both domestic and international audiences. The objectives of the doctoral research conducted for this project were to study creators’ organisations (COs) as participants and shapers of copyright policy: to understand how these actors behave, what environment they operate in and what effects this environment and organisations’ workings produce on the nature and substance of copyright law and policy. Ms Kostova undertook a study of the Musicians’ Union (MU), the Performing Right Society (PRS), the Society of Authors (SoA), and the Authors’ Licensing and Collecting Society (ALCS): one trade union and one collective management organisation (CMO) from the music and publishing industries respectively. She analysed a combination of primary data generated through 24 semi-structured interviews with CO operatives and documentary data. The latter included consultation responses, policy briefings, reports, online news publications, IP reviews, academic studies, and other literature. The analysis was structured around the policy work of the four studied COs on three copyright issues of contemporary relevance: the contractual terms for authors and performers, the UK private copying exception, and the implementation of the EU Collective Rights Management Directive. The doctoral research found that creators’ organisations are important and valuable actors in copyright law and policymaking and should therefore continue to participate in these activities. However, the behaviour of these organisational actors who represent broadly the same copyright stakeholder group (creators, rights owners) is far from uniform. Complex dynamics and power imbalances exist between individual organisational actors but differences in the behaviour of individual actors and in the dynamics that govern their interactions are not fully understood by policymakers. A briefing paper prepared by Ms Kostova outlining the objectives and key findings of the doctoral research, along with a set of recommendations for creators’ organisations, was sent to all research participants. This blog was originally published on Cabaret of Dangerous Ideas and is a Q&A on my Edinburgh Fringe 2017 show ‘No copyright, No problem?’ (1.50pm, Wednesday 16th August at the New Town Theatre). 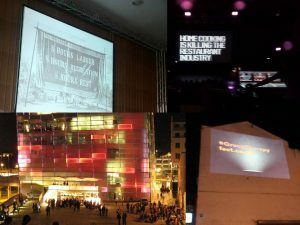 The provocatively titled show was inspired by my fieldwork conducted at the Edinburgh Festivals, including the Fringe, in 2014 and 2015 and I drew on extensive empirical research on the perspectives and practices of individual creative practitioners (writers, illustrators, and visual artists) to ask whether copyright matters or could we live without it. Lecturer in Intellectual Property Law at the University of Edinburgh. Feminist. Former amateur DJ. My CoDI show is derived from research I conduct on copyright ‘law in action’; as opposed to just ‘law in the books’. Mainly I have been investigating whether copyright continues to play a useful role in creative practices. The show is inspired by fieldwork I conducted at the Edinburgh Festivals in 2014 and 2015 when I interviewed various writers, illustrators, comic book artists, visual artists and performers to find out what is the relevance of copyright, if any, in their everyday creative lives. The topic is dangerous because it delves into the question of what would happen if there was no copyright, and relatedly, whether or not copyright currently has a positive role in today’s post-digital society. Dumping copyright might, on the surface, sound like a good idea, but the idea actually carries dangers with it because copyright protects both creative works and the livelihoods that many creators successfully derive from them. If copyright disappeared, would we all really be able to ‘freely’ download and share all the content we like (e.g. Game of Thrones episodes, Harry Potter books, and Ed Sheeran songs)? Or, would other restrictions perhaps replace said copyright law and be even less desirable? Additionally, without copyright, would artists continue to create content and pursue financially sustainable creative lives? Would a sufficient number of artists continue to create so that we can continue enjoying reading, watching, listening to new creative content? And if so, what kind of artists will they be? Perhaps most dangerously of all, without copyright protecting creators and their works, will large corporations like Google benefit more as they will be able to scoop up mountains of “free” content that they can then monetise ? Does it rightly have this label? Is the topic unjustly controversial? A cursory look at popular media demonstrates that not only is copyright protection highly controversial but also an issue that polarises opinion, and although we mightn’t often think about it, copyright is ubiquitous. In fact, it intersects with our lives on a daily basis. Whether or not you are a professional content creator or producer, you are still likely to be regularly engaging with copyright protected content: watching videos on Youtube, taking photographs to share on Instagram, reposting a funny comic or illustration you found online on Facebook. The examples are endless (and they are not limited to the digital environment). If you are a professional content creator or producer then you will be routinely dealing with copyright in the various contracts and agreements you enter into (not as simple as it sounds). Yet, copyright is more controversial today than it has ever been. The very ability to easily create, edit, and share copyright content has raised questions about the role of copyright. Do we need copyright when it poses restrictions on this process of creation and sharing? Do content creators really benefit from copyright? Is it an unjust monopoly? Copyright is a complex issue. It is important to me that research is used to examine the nature of the various myths and misunderstandings that have built around copyright, and to also properly assess if copyright can, or in fact does, play an important role in the lives of creative practitioners. Because they will go boldly where no Fringe-goer has gone before! At the largest arts festival in the world, the unenlightened Fringe-goer will see many artists and enjoy lots of creativity. As patrons and consumers of art, they can learn from my show, whether copyright law matters to artists, creativity, and society, or could we live without it. This blog discusses copyright issues with a focus on creators and their day to day creative practice. The blog also provides information about two research projects that are under way at the School of Law, University of Edinburgh and led by Dr Smita Kheria, as part of the research programme of CREATe. Images used on the blog have either been taken from Creative Commons licensed sources (original links to which are available through the images) or used with express permission obtained from the copyright owners.